Albany's Downtown Revitalization Initiative (DRI) application -- it's embedded at the bottom here -- includes a bunch of bits about the Clinton Square area and surrounding neighborhoods. It's worth flipping through. But we're just going jump straight to what's probably the juiciest part: the projects that are provisionally in line to get money. That list is directly below. It's important to note that these projects will not automatically get a portion of the $10 million. The actual allocation of the money will happen via a strategic investment plan that will be developed by "a Local Planning Committee made up of municipal representatives, community leaders, and other stakeholders will lead the effort, supported by a team of private sector experts and state planners" in 2019. Proctors and Capital Repertory Theatre will convert the ruins of the former Church of the Holy Innocents into an open-air artist venue and park. The Church will host live theatre, concerts and events during summer months, attracting an estimated 12,000 people to the area each year. This $1.3M project will stabilize and preserve the remaining elements of a registered historic property that is too dilapidated to be fully restored. 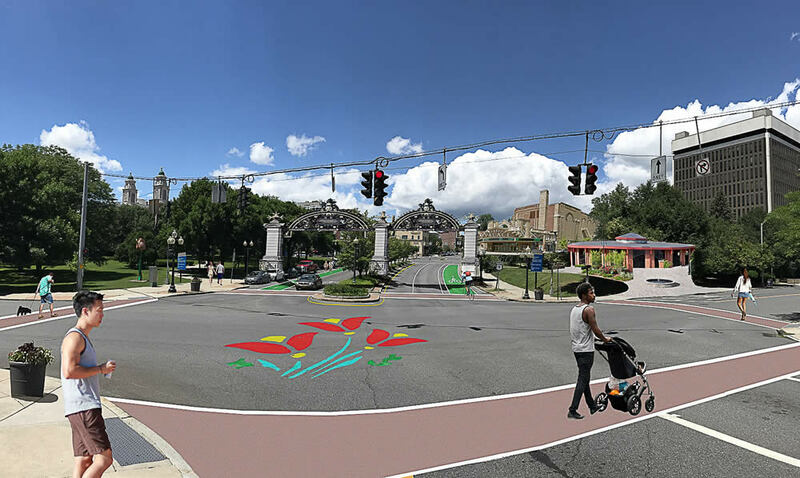 It will also remove a major area of blight from the neighborhood and develop the site into a park and green space open to the public year-round, leveraging surrounding development at Capital Repertory Theatre, Albany Distilling and other projects. A renovation of the church building is notable because 1) it's vacant, in bad shape, and is across the street from where a lot of people live and 2) local preservationists have been worried about the historic building. 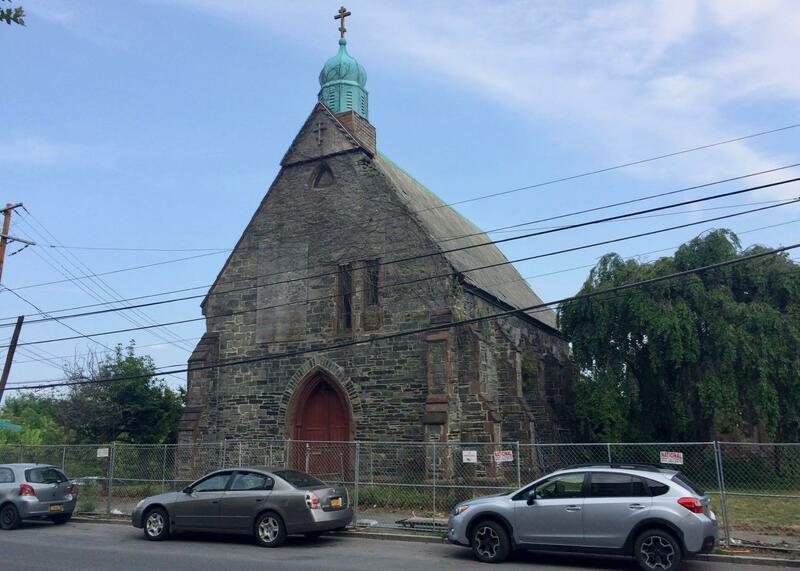 For what it's worth: The building is currently owned by developer Patrick Chiou, who recently completed the renovation of residential buildings behind the church on Broadway. And back in July he told us that he was planning to turn the building into a coffee shop/juice bar with work/study space and had applied to a different state agency for funding. So this could maybe go few different ways. This is the Home Leasing project that's aiming to renovate 70 row houses around Clinton Ave into affordable housing. It's an important project for the neighborhood and the city. 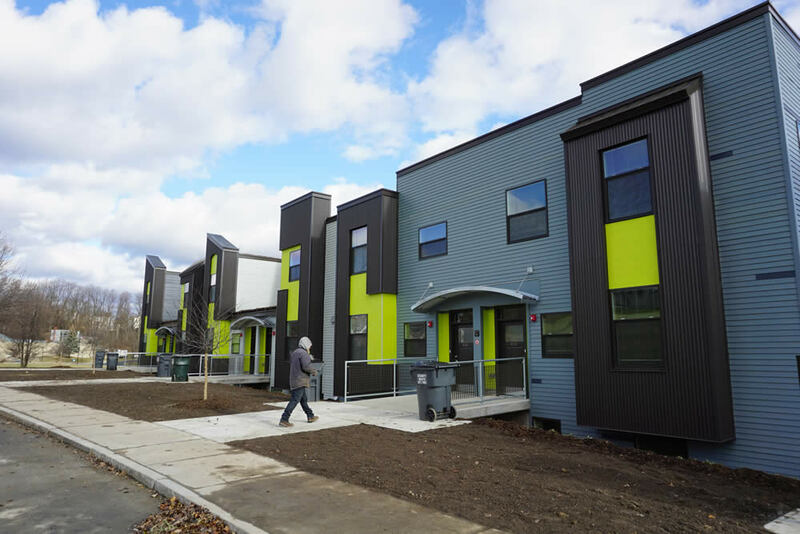 The third phase of the ongoing reconstruction of the Ida Yarbrough Homes is slated to have 10 new units that people will be able to buy and own. New to us: There's apparently a potential plan to build a new apartment building at 745 Broadway with 130 residential units, retail space, and a garage with 225 spaces. Notable because 1) The ongoing addition of residential to downtown(ish) Albany, 2) it would continue to fill in that section between downtown proper and the Warehouse District along Broadway, and 3) it would be new construction. To this point in the downtown residential boomlet the currently-under-construction 760 Broadway building (88 units) has been just about the only new-construction project. "[R]ehab of former police station into 6 new residential units and ground floor space for the Cyber Hub." This building was on the Historic Albany Foundation's endangered historic resource list in 2015. "The Clinton Container Complex, a new three-season food and beverage hub will take advantage of prime, underutilized property at the corner of Clinton Avenue and Broadway, across from the Palace Theatre. The planned market concept will incorporate informal sites for local arts and cultural assets; provide a market setting for fresh foods and local goods alleviating the food desert for nearby neighborhoods; cultivate local businesses by providing concept-proving space; serve as a launching point for the Capital Craft Beverage Trail and Skyway; and incorporate a modern visitors center and wayfinding hub." 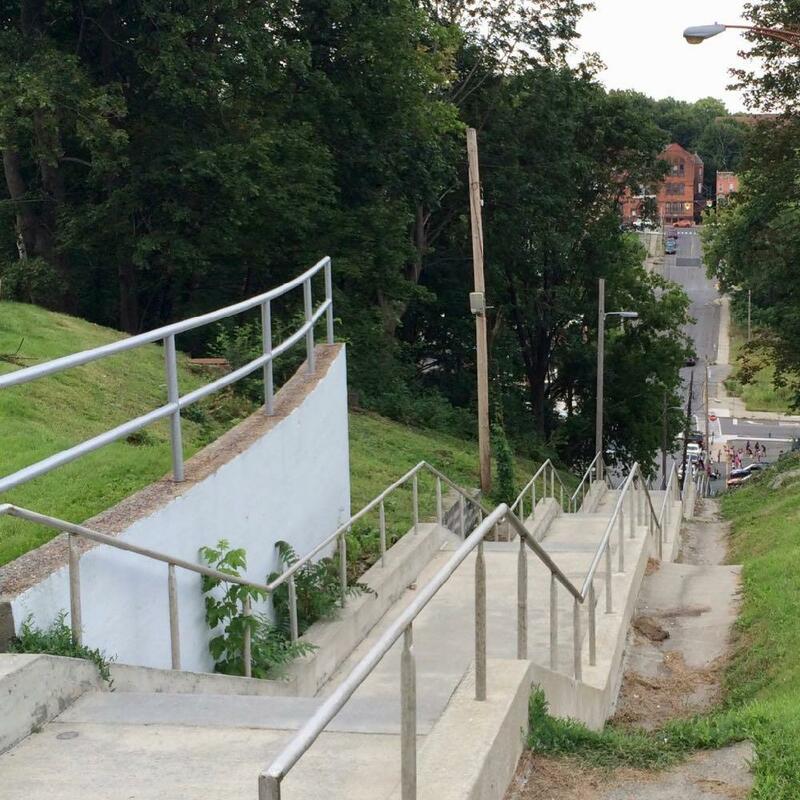 A proposal to reconstruct the steps and lighting that connecting Sheridan Hollow and area atop the hill near the Capitol. The neighborhood is so close to the Capitol, but that hill is real barrier. And doing something about that issue was a major focus of the Rezone Albany session on the neighborhood. "Installation of public art, signage, and lighting connecting Downtown to the Warehouse District." That space is not currently welcoming. Also: Why is it always dripping? Ten million dollars is a lot of money. It's also not a lot of money when it ends getting spread around a bunch of different projects, especially when they're large projects. So it seems like one of the key questions for the group that will decide how to divide up this money. Is is the best thing to sprinkle the $10 million around this section of the city like fertilizer -- a little bit everywhere in the hopes of giving a nudge to a bunch of projects. Or is it better to pick a handful of items and give them more of a push? Not one mention of St. Joe's. Great we get $10.mill create some lovely new projects , and then where in the budget is the upkeep on all these projects. We have a huge need to fix our current infrastructure now. I'm tired of my own neighborhood looking like crap. The trees are dead.the side walks are buckled. And no one appears to care. The police station is in horrible condition . the roads are full of pot holes, every time we turn around there is a new sinkhole opening. FIX WHAT WE ALREADY OWN! I love the fact that the Sheridan and Chapel storm sewers are getting some attention. I've seen that corner knee deep in water multiple times over the past 10 years. I think most of the projects are window dressing. Albany needs real attention paid to its more critical issues - water mains, road paving, abandoned buildings etc. Anyone else notice Ida Yarborough at the bottom of the list? $3.4 million for demo and construction of 10 new homes. $340,000 homes! I would think you could built 30 homes for that price. Is someone going to look into these assumed cost or we just giving the money away because it isn’t ours? Replace those sheridan hollow steps with a street like Lombard st in San Francisco. Develop that huge empty space between the plaza and 787. Yes, upkeep is needed! No more $ for paint on pavement. Gosh, those Sheridan steps DO need help! And there should be an alternate method to get up that hill for people with disabilities or with regular old aches and pains. Funicular anyone? Actually it is not $340k, it is more like $465k, or maybe $408k: total of 129 units for $60M. That is 61 unit in first phase, 76 in a second and 10 in a third phase. Something is wrong with arithmetic, but who cares. But keep in mind, this is not studio-1 BRmix developed commercially, this is up to 5 BR places. Haha I've also been wondering why that bridge is always dripping. We call it the weeping bridge. Thanks for this article. This $10M was great news. I'm hoping some money is used to kickstart work on the police station, but I'm kind of partial because I live next door. It looked like the most abandoned building ever until someone cleaned it up a little last week. Besides the police station it's a pretty nice street to live on. I'm pretty sure any renovation planned is being held up by a required asbestos abatement. If the city clears that issue up it might get the developer moving again. For the warehouse district gateway/bridge we could definitely use some more lights under there, and maybe one of those mirrors that let you look around the corner..? I'm looking forward to the Skyway but it's not a lifechanger. Jennings landing is only about 5 minutes away. But I will be happier to be closer to the new Riverfront Bar and Grill. Any news on when that's happening? Regarding the Sheridan steps, I'm not really sure what the issue is. There's a huge hill, and they built steps to walk/run up them. They're essentially Albany's version of the Rocky steps. I've brought some friends to run them with me and they are a tough workout. It's a longer run than it looks.